It has long been unclear whether higher doses of SSRIs are associated with greater response. What has been clear is that higher doses are associated with significantly increased side effects. In fact previous research, whether individual studies or meta-analyses have failed to find a significant dose response with the result that many have felt that there is a flat dose response curve. Higher doses don’t lead to greater effects. An article by Jakubovski, et al, in the February 2016 the issue of the American Journal of psychiatry evaluated 40 randomized controlled trials. Their study addressed a number of the limitations of previous analyses. They show a modest increase in efficacy for higher doses of SSRIs in major depressive disorder. They replicate previous findings that this modest increase in benefit is associated with a significant reduction in tolerability. 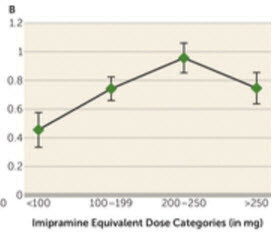 In the chart at the right you can see that overall dose-response increased to about 200 – 250 mg of imipramine in a relatively linear fashion and then actually dropped. Their analysis suggests that these modest benefits may exist for only a portion of patients being treated with SSRIs and point to the importance of methods for identifying those who are more likely to need higher doses, such as the use of genetic markers, including the assessment of cytochrome P450 genotypes (see our article on the Genomind Assay).